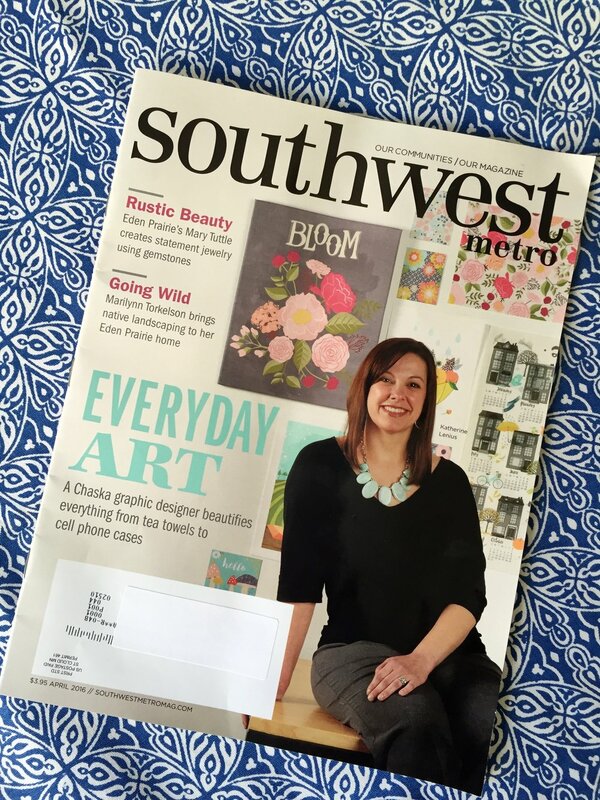 Imagine my surprise when my face turned up on the cover of Southwest Metro Magazine! 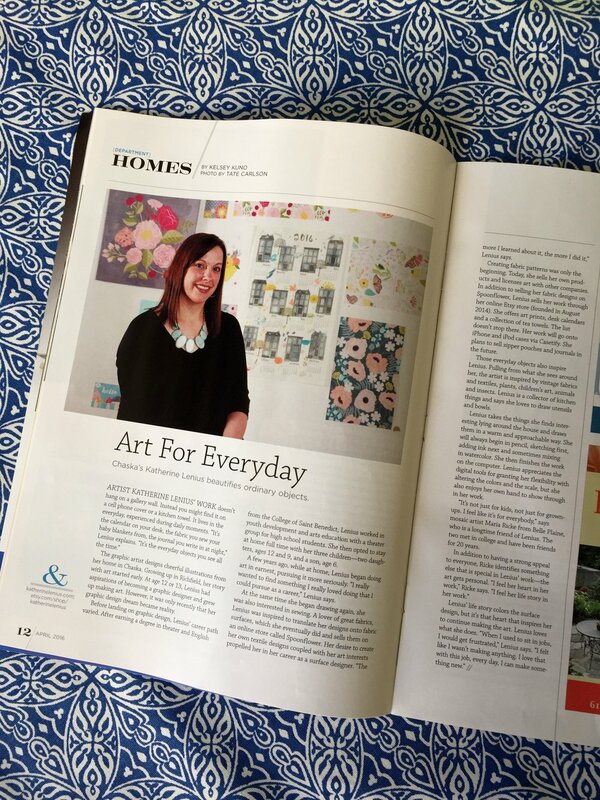 I was tremendously honored and flattered to be included in a feature on local artists for their April issue. They first contacted me a few months ago to do an interview with them (the editor found me on Etsy, just one of many reasons why I love Etsy!) and then later I was asked to come in for a photo shoot. But they never actually told me it was going on the cover so I was expecting maybe a paragraph with a photo. I'll admit it's a little freaky to see your image on something like that and have it start popping up in texts from your neighbors, friends, and family: "Look what came in the mail today!" 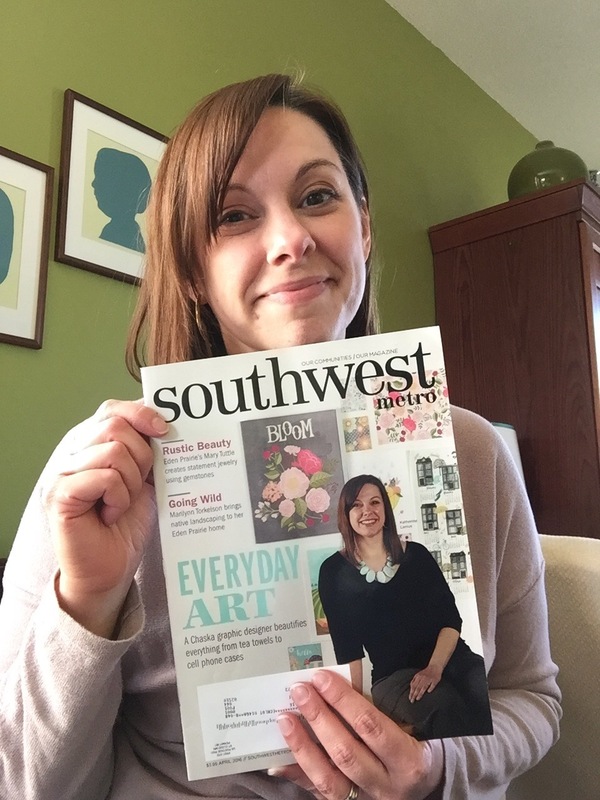 Kelsey Kuno from SWMetro did a lovely job with the article and it's really exciting to see all the work I've been putting into this new career of mine start to catch people's attention. It still always surprises me when someone wants to buy one of my art prints or orders my fabric. If anything it tells me that even though there are still many things I'd like to accomplish, in the meantime I'm doing something right. I'll post links here to the magazine and article once it's available online. Thanks for all the support! I snap pics of unusual flowers during my runs as an excuse to take a breather. 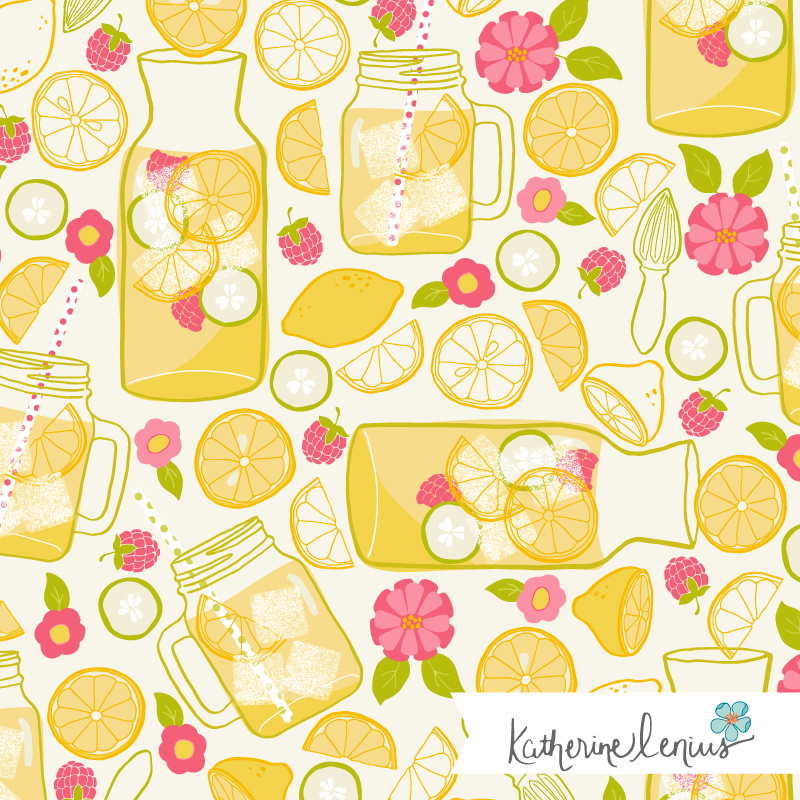 Summertime is solidly encamped here and I can't believe it's nearly half over! Summer runs twice as fast as the rest of the year. I had finally gotten into a good routine during the school year and then summer blew that all to smitherines. It's been a challenge to balance work with the kids being home and I often feel like I'm doing neither one particularly well. Luckily my kids are old enough to generally entertain themselves but one of the reasons I choose to work the way I do is because I value this time with them. I want to be able to drop everything and head to the beach if the weather is nice. I want to have a picnic lunch on a Wednesday just because we can and abandon my computer to see the butterfly Ben found in the garden. So I'm finding my way through this summer season with both frustration and success. And I'm fully aware that once I get the swing of this schedule it will be time for everyone to return to their regularly scheduled programming! Lessons to tuck away for next year undoubtedly. I continue to try and build my portfolio this summer, which has been my year-long, long-term, never-ending project. 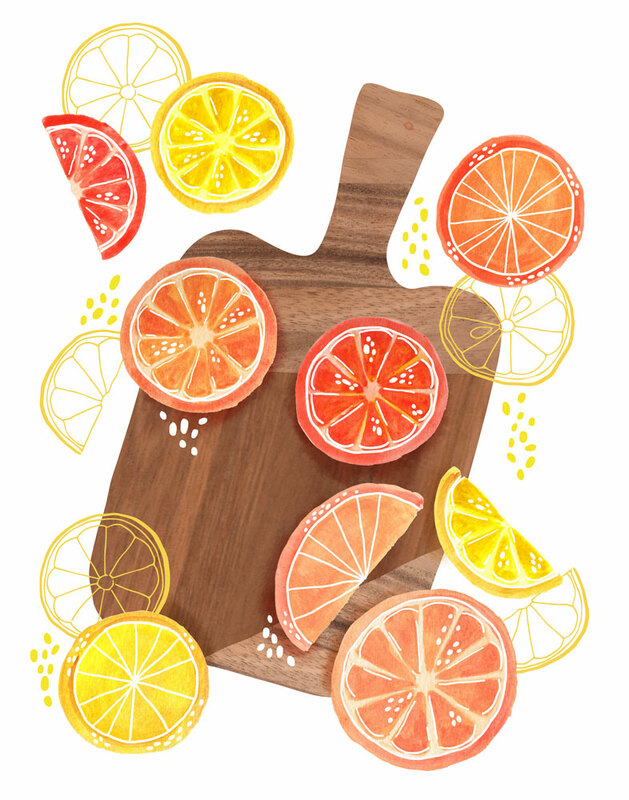 You may have noticed my new website (ta-da!) which I did a couple months back and there's a new portfolio page which I'm trying to fill up with my latest work and some older favorites. Eventually there will also be a private portfolio gallery for potential clients. I've shared a few new patterns here on the blog but lately I've been working on some paintings and illustrations because I'm doing a gallery show (!) 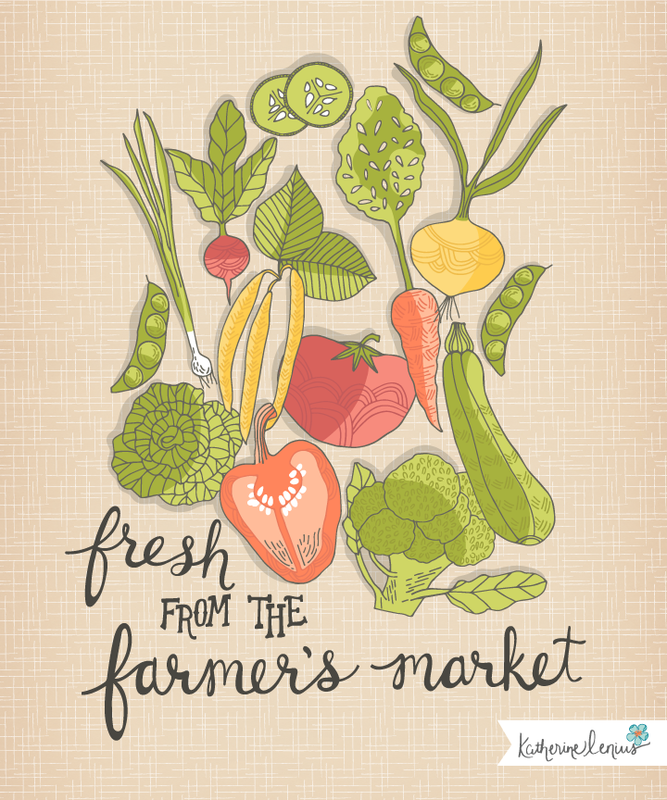 at the Chaska Community Center starting July 17. I work part-time at the Community Center teaching art classes and camps for kids from pre-school age to about 10 and was asked if I'd like to share my work in their gallery. I cautiously and trepidatiously said yes and next week I'll set up my show which will run through the end of August. It's a great opportunity to share my work with the community I live in but because I don't really consider myself a "fine artist" I was worried that my work might not be a good fit for this kind of venue. I know I'm not the only one who fears their work isn't good enough or "right" or has a certain kind of value. But I've jumped in with both feet and hope to do a show that shares my love of bringing art and design to the everyday. More details and pictures to come! 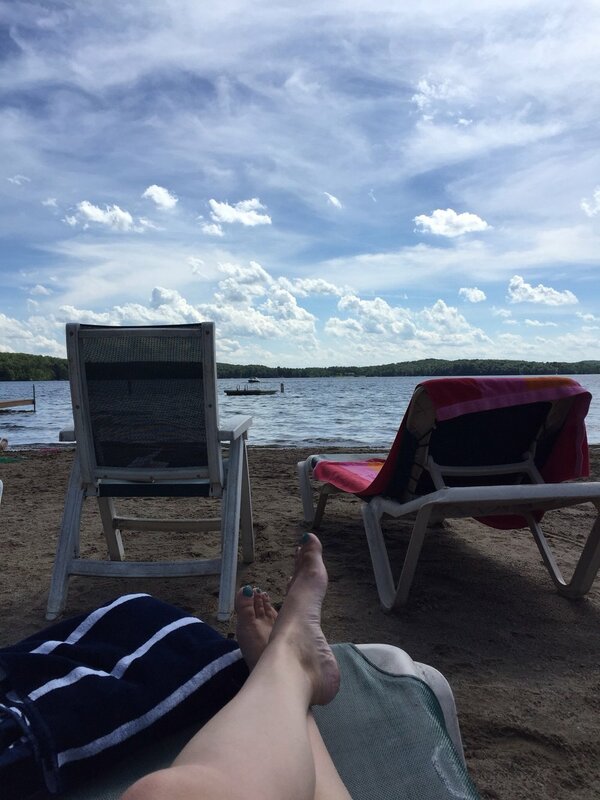 Summer also brings some fun vacations for our family and in June we spent about a week at a resort on a lake in northern Minnesota which I always love. It felt pretty good to walk away from everything for a little bit. I've always felt very at home on the water - when I'm trying to relax I always picture myself sitting by a lake. 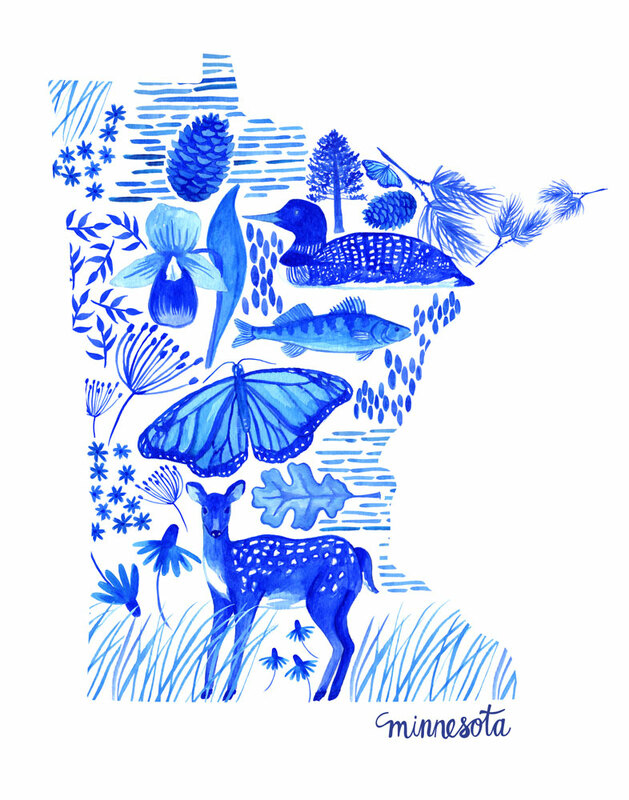 That trip made me think I should do a few pieces about my home state and inspired this Minnesota watercolor collage. I'm coming to appreciate how the gallery show is forcing me to think about my work from a new perspective and think about the story I want to tell and how other people will view it. In the meantime I'll continue to navigate the sunny, sticky, and breezy summertime while getting some work done and plenty of fun done too. If you know me at all you know how much I love gardening. I never had much of a green thumb when I was younger (in fact I still can't keep a plant alive indoors! Go figure.) but when we started making plans to move into our home over ten years ago (my first real house with a yard) I got the itch to garden. In my characteristic obsessive way I immersed myself in gardening books and blogs and tried to learn every little thing I could about gardening. Of course anyone who gardens knows that you can only really learn how to garden by doing it (like most things I suppose). Planting, growing, failing, succeeding, it's a constant cycle when you're nurturing plants. I can't even tell you how many things I've learned from gardening: patience, tenaciousness, humility. And I love the cyclical nature of gardening too. I appreciate spring in a whole new way since I started gardening. 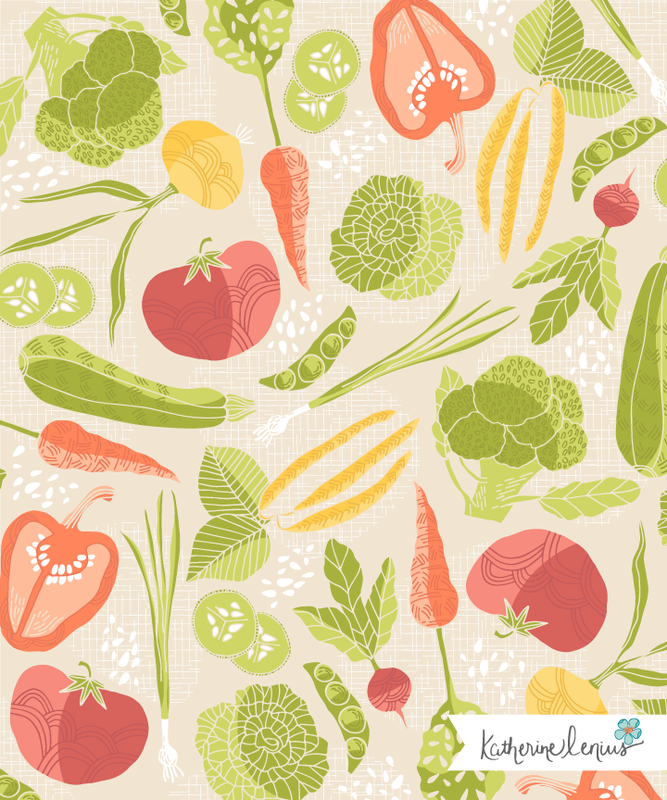 My husband says I draw a lot of vegetables in the spring/summer and I suppose he's right. They're on my mind! I have a lot of perennial flower beds and shrubs, but my little kitchen garden has a special place in my heart. 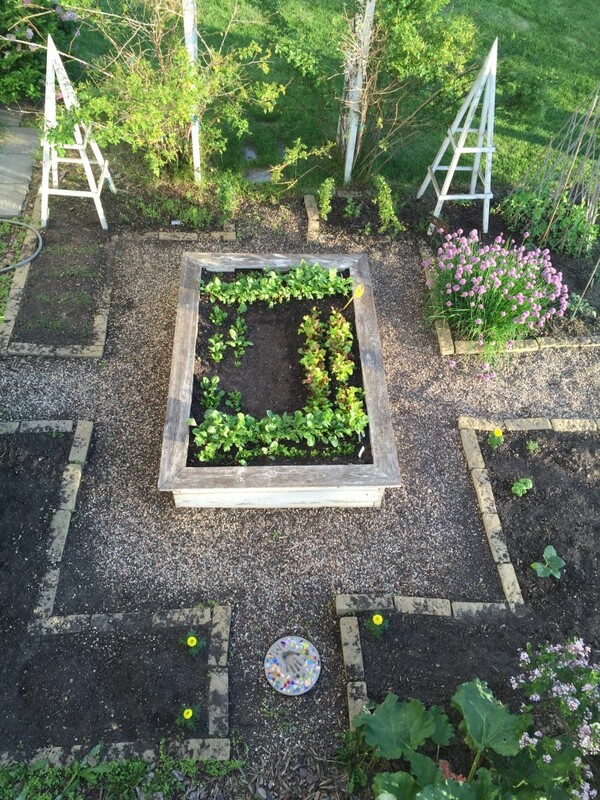 I never thought I would grow vegetables - I had zero interest in it but I changed my mind when I saw all these pictures of beautiful kitchen gardens or potagers (a garden near the house that grows everything for your table, from flowers and herbs to fruit and vegetables). Our little garden has herbs, flowers (zinnias are my favorites), and veggies: lettuce, snap peas, beans, squash, carrots, tomatoes, eggplant, and whatever else we decide to throw in there. Nearby we have rhubarb and a strawberry and raspberry patch. My kids usually take over the center raised bed. One year it was a rainbow garden, last summer they planted a salsa garden. I try to only grow what I know we can realistically eat because I'm not a canner/preserver. The thought of canning hundreds of pounds of tomatoes in late August gives me the sweats. But I love that little garden, it's kind of magical. And a whole lot of work. And sometimes I swear a bit when something's been eaten by a critter or plants mysteriously up and die. But still . . . magical. All this to say I get a lot of inspiration from my gardens because I love drawing flowers and food. I have a few new pieces of work to share with you that come straight from my garden inspiration. The first features veggies from the farmer's market (or garden). This next collection was inspired by the June issue of Better Homes and Gardens, a magazine I've subscribed to for years. I often find color palettes and images that inspire new designs. Sometimes I just sit with the latest issue and sketch whatever I'm interested in as I turn the pages. 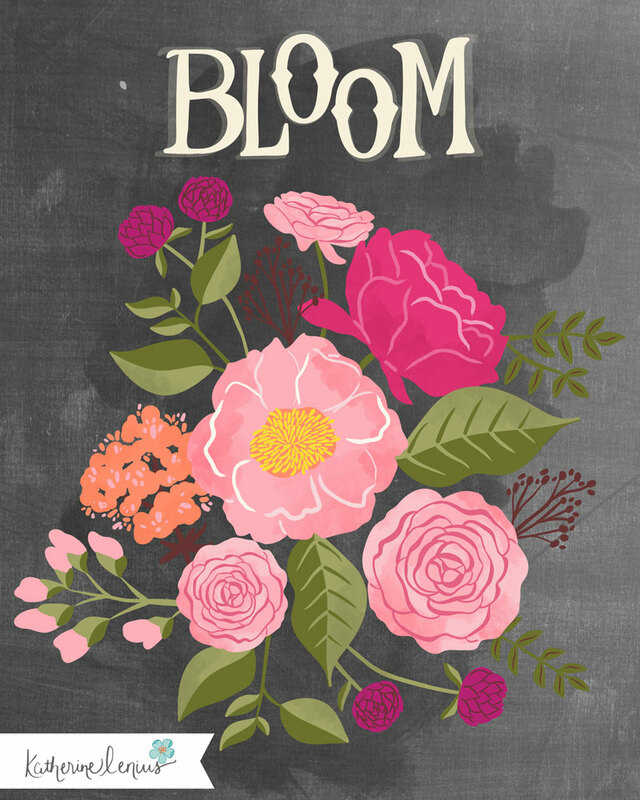 This design also features peonies, which are one of my all-time favorites and I have several of them blooming in my yard as I write this. 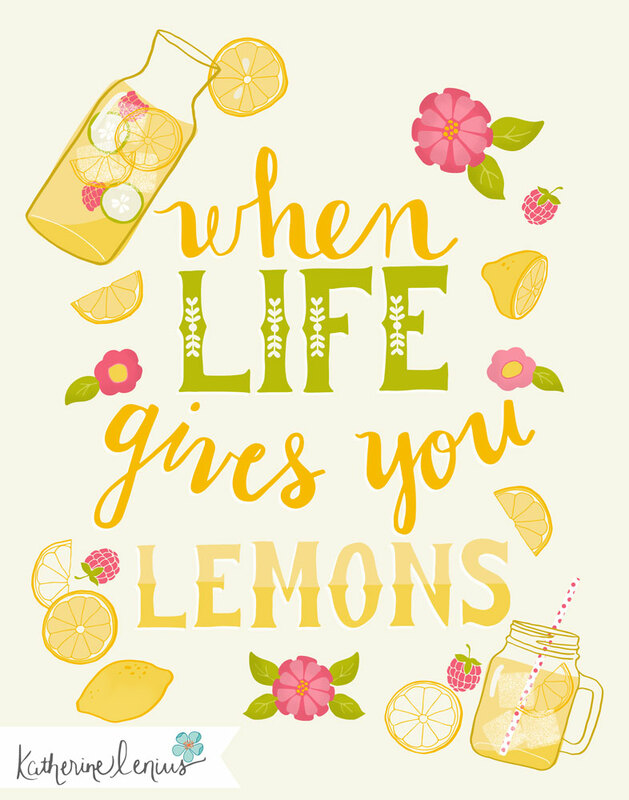 Finally, because summer has arrived, a little summer inspired lemonade design, originally for a Spoonflower contest and a chance to practice more hand lettering which I'm trying to do more of. 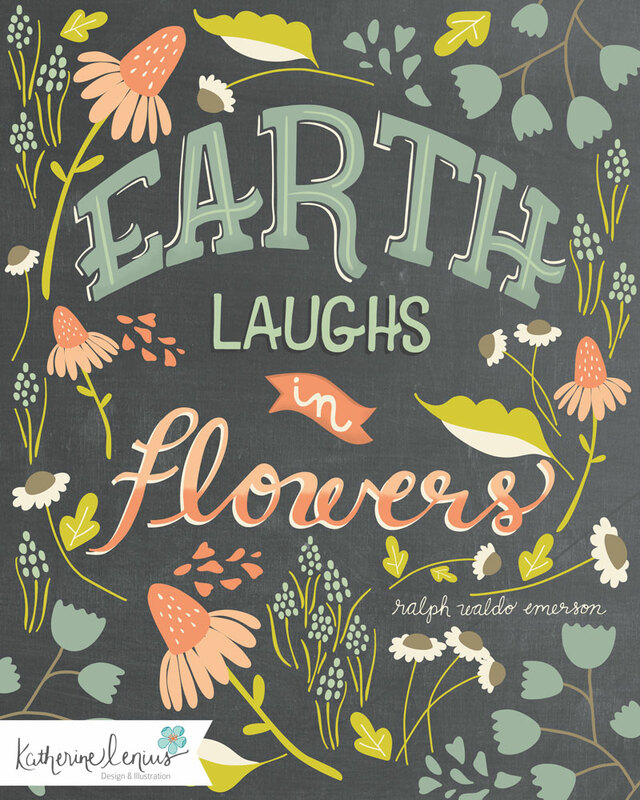 I hope you enjoy whatever happens to be blooming near you! One of my favorite shops in the Minneapolis area is Bachman's, a home and garden store with a great gift section. Bachman's is my go-to place when I'm spending my kids' college savings on plants for my garden and it's a fantastic place for eye candy, color and trend inspiration, and "market research" (I love calling it that). 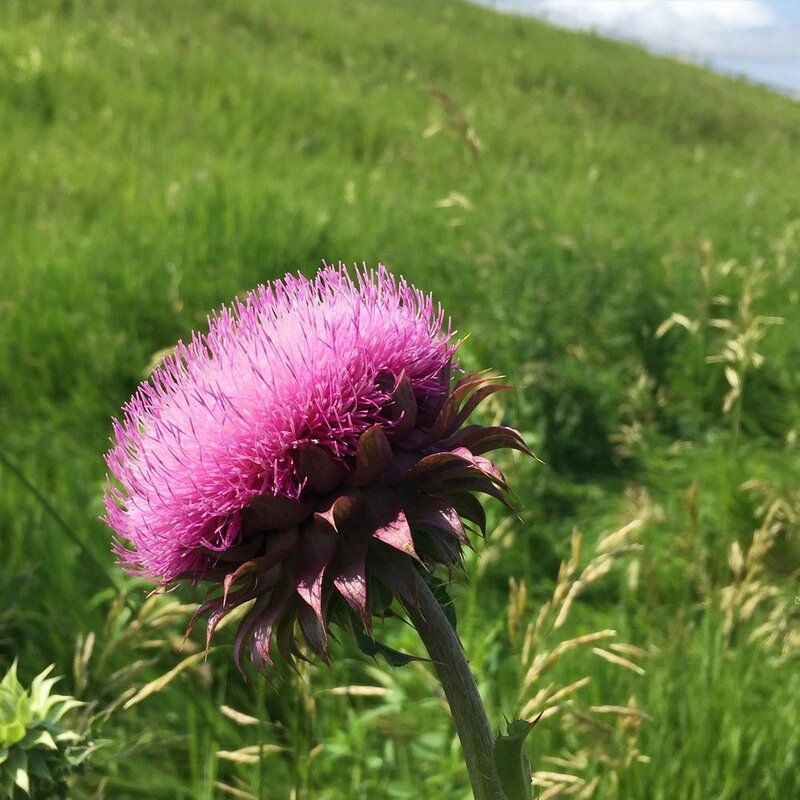 In the past couple weeks I got some great spring inspiration courtesy of Bachman's that I thought I would share - come along, it's field trip time! Every year the downtown Minneapolis Macy's partners with Bachman's for a spring flower show. Focused around a central theme, it includes elaborate horticultural displays and as both an artist and a gardener I just loved it. This year the display was called Art in Bloom and it used movements in fine art to influence the displays. There was a Cubist garden, a Modern garden, Abstract, Surrealist, and Impressionist garden among others. Sometimes the plants had been arranged in a grid formation, other times they were placed in a scattered, free-flowing way. Color themes went from mostly white to a kalediscope of bright colors and included a lot of my favorite spring flowers and shrubs: tulips, hyacinths, peonies, ranunculus, and azaleas. Unforunately since it's an indoor event my photos aren't the greatest but there were some fun color palettes. About a week later I went to the Bachman's Spring Idea House. The original Bachman's store sits on a property adjacent to the old Bachman's family home and now they completely re-decorate the home every season and open it to visitors. They always have such great ideas and use unique materials - it always makes me want to come home and re-decorate my own house top to bottom. My impulse control is not so good. The color palette this season was mostly in pink, green, and cream in the main living area. There were a lot of botanical influences, geometric terrariums, moss, and aged wood. I love the rainboots filled with flowers (that's already inspired a new illustration I'm working on) and that awesome shower curtain. There was an upstairs bedroom with a bicycle theme that my 11 year-old daughter would drool over. The store itself was filled with even more colorful displays like the table setting on the lower right in shades of turquoise, coral, and yellow.